Size: 590 sq.ft. - 925 sq.ft. The most prime location of Badlapur is getting updated with another residential project known as Kalp Nisarg. Kalp Nisarg project is built by reputed real-estate group Kalp Builder. The project was launched in the year 2011. Kalp Nisarg towers are developed over the landscape of 2 Acres with 15% open space. After the success of Phase I of Kalp Nisarg, the builder has decided to add one more Phase to the community with all state-of-art amenities. It is surrounded by beautiful lush green nature, serene environment and clean pollution free atmosphere with Matheran hill view. The configuration of Kalp Nisarg Phase II offers 1 & 2 BHK luxurious homes. The first phase of this property is ready to move in where the Phase is under construction. Buyers or investors can avail these homesat very affordable rates with the starting price of 24 L to 35 L.
Kalp Nisarg is known to be the most popular residential project in Badlapur East.These apartments are parted in Phase 1(ready to occupy) & Phase 2. These two phases of Kalp Nisarg consists of 5 towers and more than 200 units in it. Each tower is having 8 floors with wide balcony to each apartment.The apartments are available with the sizes of 1 BHK & 2 BHK where the unit sizes ranges from 590 Square Feet to 930 Square Feet. The interiors of Kalp Nisarg homes is designed using designer tiled floors, granite counter in kitchen, huge windows and intercom facility. The majority of the space is converted into the empty landscapes. It is fully equipped with day to day latest features what a home seeker look for. The builder has ensured each homes of Nisarg community get ample of natural light with proper ventilation. Kalp Nisarg is in Thane district about 50 Kilometers from Mumbai. Badlapur East is a fast growing city. Kalp Nisarg location very suitable for those who are looking for buying & investing in project which gives benefit of daily commuting. The location has smooth connectivity via the Mumbai-Pune expressway. NMMT buses and fast trains are the main means of transport. The nearest railways station is located at a distance of 3.1 kilometers, ChhatrapatiShivaji International Airport at 49.2 Kilometers. Badlapur is home to various reputed schools, shopping malls, colleges, hospitals, banks and recreational areas. The location of Kalp Nisarg makes sure that the home-seekers are choosing the right apartments for themselves. 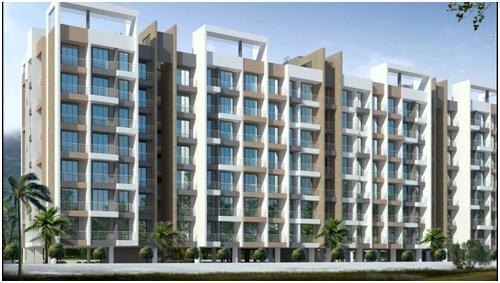 It is one of the most prestigious addresses of Mumbai with many facilities and utilities beyond thane. Kalp Nisarg project is located at Shirgaon near Holy Writ School, Badlapur East beyond Thane, Maharashtra. The amenities include Swimming Pool, Lift, Security, Park, Reserved Parking, Service/Goods Lift, Club House Unique, Jogging and Strolling Track Unique, Cycling & Jogging Track Unique, Private Terrace/Garden, Power Back Up, Visitor Parking, Intercom Facility, Maintenance Staff, Flower Gardens, Laundry Service, Library And Business Centre, Rain Water Harvesting, Water Storage, Multipurpose Courts, Meditation Area, Vaastu Compliant, Waste Disposal, Fire Fighting Equipment Banquet Hall, Gymnasium, Indoor Games Room, Kids Club, Kids Play Area and other sports facilities. Schools - Yogi Shree ArvindGurukul, podar jumbo kids plus daycare, Rainbow Preschools, Holy Spirit High School, SamarthaVidyalay, S.D.M English High School. Hospitals -SaiSparsh Hospital, Shree Clinic, Swanand Children Hospital, Shree SiddheshwarPavnai Nursing Home, Ashwini Hospital. Pharmacies - Vijay Medicals, Ambika Medical And General Stores, Ravi Chemist, Jeevan Deep Medical, Sachin Medical, Maharashtra Medical Stores. Parks -PandulkarUdyan, Mhada Colony Garden, MeenataiThakareUdyan, Vijay Park, Swami Vivekanand Garden. Shopping Malls/Centres–Mrunal Plaza, Krishan Mini Mall, Metro Junction Mall, Sarvoday Mall, Trimurti Complex, Pari Enterprises, D-Mart. Bank/ATMs - ICICI Bank, HDFC Bank, Union Bank of India, State Bank of India, IDBI Bank. Railway Stations – Badlapur railway Station, Ambernath Railway Station, Vithalwadi Railway Station, Ulhasnagar Railway Station.